MODESTO CA USA -- HEALTHCARE UPDATE NEWS SERVICE -- NOVEMBER 3, 2017: The November 2017 issue of Predictive Modeling News features "Journal Scan: Hopkins Team Sees Risk Stratification Value in Rx Fill Data." Subscription and detailed information on Predictive Modeling News is available at www.PredictiveModelingNews.com. 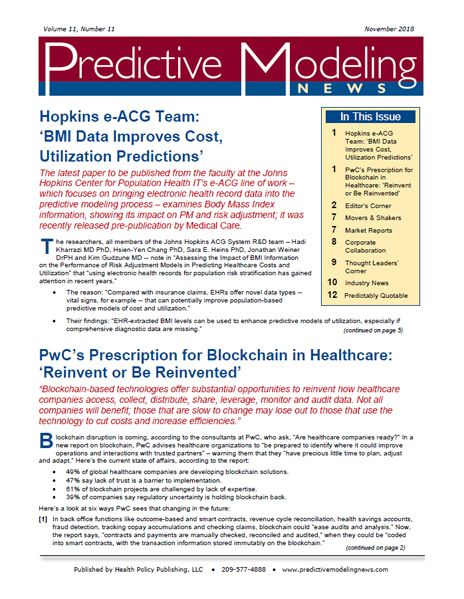 Predictive Modeling News is the monthly publication from Health Policy Publishing, LLC, which also offers Population Health News; Accountable Care News; Medical Home News; Readmissions News; Value Based Payment News; Healthcare Innovation Bulletin; Health Insurance Marketplace Bulletin; HealthChangeBulletin and Workplace & Retail Clinic Bulletin. Thought Leaders' Corner: "Overall, where on the spectrum are most healthcare organizations re: capturing physician EHR data for analytics purposes?" Subscribers receive this and future twelve page monthly issues with a choice of electronic or print newsletter delivery, or both, and online access to past issues and more. Featuring articles, news, key data, technology developments, results from recent studies, interviews, case studies, and much more.